The youth of Leicester gathered at The Shed again tonight for another Young Bands showcase. 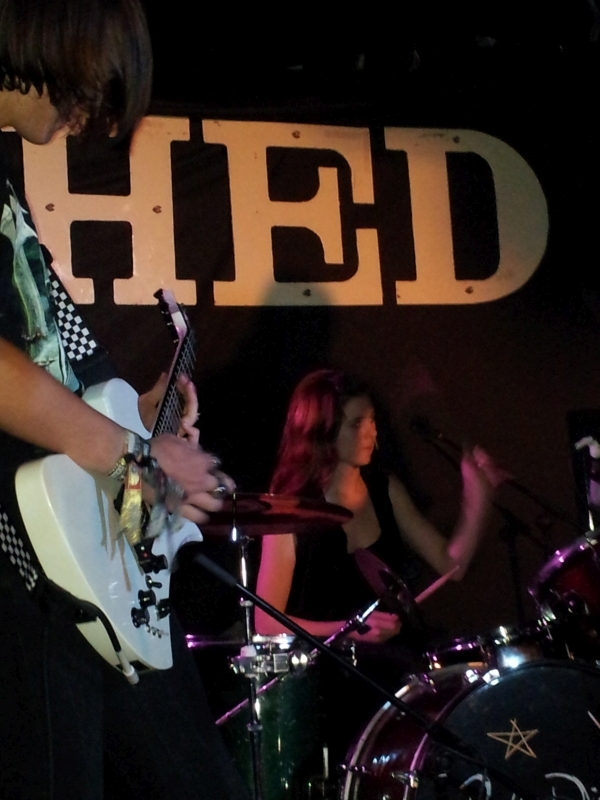 Providing a stage for young bands and artists has become a regular feature of The Shed’s monthly calendar of live music. The next showcase gig for young bands takes place on Wednesday 5th November. Not the best night for young people and families perhaps but if you don’t want the fireworks outside get some fireworks inside with House on Fire and the Little Red Riding Hoodies and some more to be confirmed. Watch the listings for more details. Tonight we saw Kirby, Kieran Marshall, Emily Carr, The World Can Wait and IV. Tonight’s opening act saw a set from singer Kirby accompanied by Dillon on the guitar. Kirby, from Swadlincote, had an impressive voice that mesmerised the audience. Her confident stage presence and fine articulation of the lyrics delivered a very enjoyable set. Acoustic guitarist Kieran Marshall showed some pretty advanced techniques, including playing the strings along the stem with both hands and intricate finger picking. He performed the theme tune from the film Titanic. Kieran changes guitars, ensuring he had the right instrument for the tune he played and the played standing up (many other artists would have sat down.) The audience were spell-bound and his nicely varied set of pieces won their enthusiastic acclaim. Kieran was joined by Alicia who sang a song to his accompaniment. She sang Adele’s Make You Feel My Love. Emily Carr enchanted the audience with her delicate voice and fine guitar work. In her set of folksy songs, Emily showed her skills as both a singer and instrumentalist, putting on an impressive performance of her own songs and some covers. Emily conveyed mood and atmosphere through her songs. The showcase events for younger artists have attracted acts of a high standard from the teenagers of Leicester. They represent so much more than the average youth talent show. The performers, both bands and soloists, have always been of a consistently high calibre. These shows are public concerts, part of the monthly calendar of the venue. Some of tonight’s acts will go on to play at gigs that are mainstream evenings at The Shed. Many have been booked to play at other live music venues in the city. The World Can Wait is a Leicester band that is no stranger to The Shed. They have played at many other venues, being brought into the line-ups of successful and popular gigs. The Shed is however a venue that saw them launch their musical career, as one of the up and coming young bands in our local area. Each time that I see this band, they just get better and better. Tonight TWCW played a number of new songs for the first time – something that makes them stand out – the ability to write new material on a regular basis. This is no fluffy emo band – they know how to tackle some electrifyingly big beats and Sully Archer’s vocals can pack quite a punch. He knows how to act a song, to bring it alive, and his singing captures strength and tension. The band’s performance tonight was impressive on all counts. TWCW is one that is not afraid to tackle songs with which many other bands would not feel comfortable. Their music is exhilarating and packed with power. Their set list tonight was 1. Desolation (cover) . 2. Dr. Dr. (cover) 3. Where’s My Legs Ron? 4. OOTB (Royal Blood cover). 5. Smelling Your Deceit. 6. Devil in Disguise. 7. Troubled. 8. Monster. 9. Fake Apologies. Tonight’s finale was delivered by IV, a four-piece band from Leicester with a singing drummer – Ethan Carter. 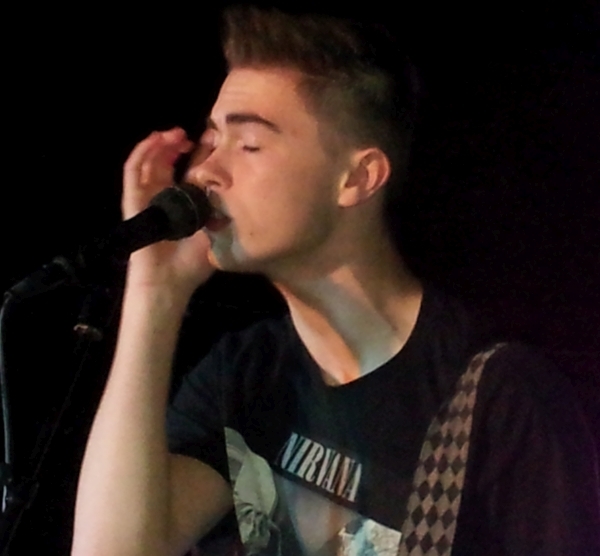 Their lively and energetic set of songs saw Ethan delivering most of the vocals. The band’s set included some covers into which they plied their own interpretation. An altogether solidly good performance. It was a memorable night and a worthwhile evening with the young bands and artists. It shows just how much talent there is around here these days.